Spring into action and register now for a Quilting Class at the QOVF conference! Two well-known instructors, Nancy McNally and Pam Heller, will teach quilting classes featuring their newly-designed patterns just for QOVF Conference using Northcott Silks Cotton fabrics. CONFERENCE REGISTRATION is required for all quilting classes and seating space is limited. Click here for details on the quilting classes. After registering for the conference, or if you have already registered, please check your registration confirmation email to verify you are registered for the sessions, and especially the quilting class you want to take. Email Conference2019@qovf.org if you have questions. See you in Grand Rapids, MI in August! FINAL Summary of QOVF 2019 National Sew Day in in! The final summary is in! 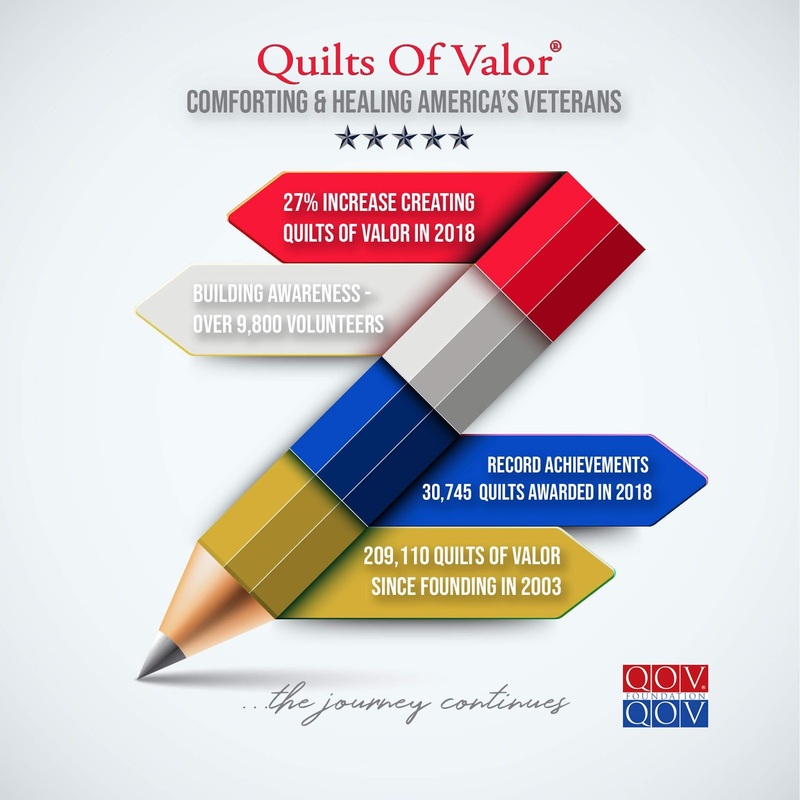 We are well on our way toward 300,000 service members and veterans being awarded a Quilt of Valor—one quilt and one recipient at a time—thanks to YOU! Over 4,100 of you—more than double of last year—volunteered to sew, quilt (longarm or machine quilt), cut, press, and beyond! In just one day, you created about 1,297 comforting and healing Quilts of Valor for America’s finest service members and veterans. Click Here for inspiring and fun comments from NSD participants; the list of prize winners; and our sew day supporters that provided almost $5,000.00 in prizes. You will not want to miss participating in next year’s National Sew Day on February 1, 2020! Contact Special Events Coordinator at events@QOVF.org for more information. First, are you ready? View this video to take a fast-paced, visual tour of the 2019 QOVF Conference. Then, review and print the Registration Quick Start Guide - latest version of Quick Start Guide 28 Feb, to make your registration go smoothly. Registration closes July 18, 2019. Are you ready? Preview the Conference agenda! Countdown to registration opening on March 1, 2019. QOVF volunteers wrapped 30,745 veterans and service members touched by war with comforting and healing Quilts of Valor in 2018 and over 209,110 since 2003. Thank you for your dedication, your time, and your talent—QOVF appreciates all you do.